Under NASCAR’s new Chase for the Sprint Cup format, Earnhardt’s 20th career Sprint Cup Series victory almost assuredly locks him into the 10-race postseason playoff, set to start at Chicagoland Speedway in September. In Victory Lane, Earnhardt didn’t even try to contain his elation. After all, he had just broken a 55-race winless streak. After finishing second in three last four Daytona 500s, he had just won the NASCAR Sprint Cup Series season opener in his last year with crew chief Steve Letarte, who is headed for the TV booth in 2015. 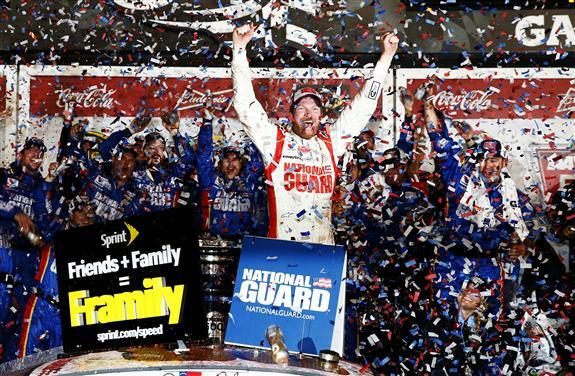 “Man, winning this race is the greatest feeling that you can feel in the sport, aside from obviously accepting the trophy for the championship,” Earnhardt all but shouted over the din of the celebration. “I didn’t know if I’d ever get a chance to feel that again, and it feels just as good, if not better than the first because of how hard we tried year after year after year, running second all those years and wondering why and what we needed to do. “I’ve got to get my head together … This race car was awesome. We showed them all night long how good a car we had, and it’s because of these guys right here (his team) putting it together in the shop. We could fight off battles after battles. We got a little help from Jeff (Gordon) to get away on that (last) restart and tried to take care of it from there. On the inside of a three-wide trio with Brian Scott and Aric Almirola, Kevin Harvick drifted up the track and clipped Brian Scott’s Chevrolet, sending Scott into Almirola’s Ford and turning it sideways. Almirola hit Danica Patrick’s No. 10 Chevrolet, which shot nose-first into the outside wall in the tri-oval, destroying the car. The No. 3 Chevy of polesitter Austin Dillon also sustained damage but remained on the lead lap. Dillon’s Richard Childress Racing teammate, Paul Menard, wasn’t as fortunate. His No. 27 Chevy, which had led 29 laps, was heavily damaged and lost 14 laps as his team worked feverishly to repair it. “What the hell happened?” Patrick said, as she slid to a stop in the soggy infield grass. Sixteen laps after the first major incident of the race, Dillon’s Chevrolet got loose and tapped the No. 42 of fellow rookie Kyle Larson, triggering an 11-car wreck that slowed the race. At Lap 184, 2011 Daytona 500 winner Trevor Bayne slammed into the outside wall on the backstretch to cause the fifth caution of the race. On Lap 194, contact between Dillon and the No. 31 Chevrolet of RCR teammate Ryan Newman ignited a seven-car wreck in Turn 3 that set up the wild finish. Earnhardt, who was in the lead, ran over the swatch of Bear Bond (tape) from Newman’s car under the yellow and tried in vain to remove the tape by driving within inches of the pace car. First out of the race was Martin Truex Jr., whose luck turned from bad to worse on Sunday. With his primary car destroyed in a last-lap wreck in Thursday night’s Budwesier Duel at Daytona, Truex had to give up his second-place starting position and take the green flag from the rear of the field in a backup car. On Lap 32, Truex’s engine expired after the oil pump belt dislodged, forcing an early exit from a race the driver of the No. 78 Chevrolet thought he had a chance to win. “The car was super-fast today, and I went to bed last night thinking that this was my best shot ever to win the Daytona 500 and really felt that way, even today,” Truex said. “The car was just so good, and we were just riding around and biding our time, being patient and trying to get to the end of this thing. It wasn’t meant to be for Tony Stewart or Clint Bowyer either. Stewart, in his first points race after missing the final 15 events of 2013 with a broken right leg, took his No. 14 Chevrolet to the garage with a fuel pressure problem after completing 118 laps, frustrated in his 16th fruitless attempt to win the Daytona 500. Bowyer’s engine expired after 127 laps, relegating the driver of the No. 15 Toyota to a 42nd-place finish. 1. (9) Dale Earnhardt. Jr., Chevrolet, 200, $1506363. 2. (4) Denny Hamlin, Toyota, 200, $1148451. 3. (33) Brad Keselowski, Ford, 200, $847721. 4. (6) Jeff Gordon, Chevrolet, 200, $731399. 5. (32) Jimmie Johnson, Chevrolet, 200, $589399. 6. (3) Matt Kenseth, Toyota, 200, $518362. 7. (34) Ricky Stenhouse. Jr., Ford, 200, $434588. 8. (25) Greg Biffle, Ford, 200, $413838. 9. (1) Austin Dillon #, Chevrolet, 200, $424674. 10. (28) Casey Mears, Chevrolet, 200, $377221. 11. (35) Joey Logano, Ford, 200, $376354. 12. (18) Landon Cassill, Chevrolet, 200, $306850. 13. (38) Kevin Harvick, Chevrolet, 200, $368196. 14. (22) Jamie McMurray, Chevrolet, 200, $361777. 15. (26) Bobby Labonte, Chevrolet, 200, $325213. 16. (39) Reed Sorenson, Chevrolet, 200, $342446. 17. (30) Carl Edwards, Ford, 200, $340638. 18. (7) Marcos Ambrose, Ford, 200, $363458. 19. (37) Kyle Busch, Toyota, 200, $373504. 20. (24) Terry Labonte, Ford, 200, $339996. 21. (8) Kurt Busch, Chevrolet, 199, $331763. 22. (19) Ryan Newman, Chevrolet, 199, $331638. 23. (29) Alex Bowman #, Toyota, 198, $334346. 24. (11) Josh Wise, Ford, 196, $322888. 25. (12) Brian Scott(i), Chevrolet, 196, $336035. 26. (15) AJ Allmendinger, Chevrolet, 194, $321788. 27. (40) Justin Allgaier #, Chevrolet, Accident, 193, $327513. 28. (23) Cole Whitt #, Toyota, Accident, 193, $315663. 29. (41) Parker Kligerman #, Toyota, Accident, 193, $318338. 30. (31) Brian Vickers, Toyota, 192, $350388. 31. (5) Kasey Kahne, Chevrolet, 192, $350413. 32. (10) Paul Menard, Chevrolet, 184, $550702. 33. (14) Trevor Bayne(i), Ford, Accident, 183, $316438. 34. (43) David Ragan, Ford, 176, $323738. 35. (21) Tony Stewart, Chevrolet, 174, $349521. 36. (17) David Gilliland, Ford, 171, $322968. 37. (36) Michael Annett #, Chevrolet, Accident, 161, $313605. 38. (16) Kyle Larson #, Chevrolet, Accident, 160, $310248. 39. (13) Aric Almirola, Ford, Accident, 146, $317939. 40. (27) Danica Patrick, Chevrolet, Accident, 145, $282778. 41. (42) Michael Waltrip, Toyota, Accident, 144, $278628. 42. (20) Clint Bowyer, Toyota, Engine, 127, $302344. 43. (2) Martin Truex. Jr., Chevrolet, Engine, 30, $292311. Average Speed of Race Winner: 145.29 mph. Time of Race: 3 Hrs, 26 Mins, 29 Secs. Margin of Victory: Caution. Lead Changes: 42 among 18 drivers. Lap Leaders: A. Dillon # 1; D. Hamlin 2-10; Kurt Busch 11-25; P. Menard 26-30; D. Hamlin 31; Kyle Busch 32-45; K. Kahne 46; Kyle Busch 47; K. Kahne 48; Kyle Busch 49; D. Hamlin 50-55; Kyle Busch 56; B. Keselowski 57; Kyle Busch 58-59; B. Keselowski 60-63; P. Menard 64-70; J. Logano 71-72; B. Keselowski 73-75; T. Bayne(i) 76-77; A. Almirola 78-82; A. Allmendinger 83; J. Allgaier # 84; D. Patrick 85-86; J. Allgaier # 87; M. Waltrip 88-89; P. Menard 90-106; J. Johnson 107-115; B. Keselowski 116-120; J. Johnson 121-126; J. Allgaier # 127-128; M. Waltrip 129-130; D. Earnhardt. Jr. 131-143; C. Edwards 144; D. Earnhardt. Jr. 145-150; G. Biffle 151-153; D. Earnhardt. Jr. 154-155; G. Biffle 156-158; D. Earnhardt. Jr. 159-172; G. Biffle 173-174; C. Edwards 175-177; D. Earnhardt. Jr. 178; C. Edwards 179-182; D. Earnhardt. Jr. 183-200. Leaders Summary (Driver, Times Lead, Laps Led): D. Earnhardt. Jr. 6 times for 54 laps; P. Menard 3 times for 29 laps; Kyle Busch 5 times for 19 laps; D. Hamlin 3 times for 16 laps; Kurt Busch 1 time for 15 laps; J. Johnson 2 times for 15 laps; B. Keselowski 4 times for 13 laps; G. Biffle 3 times for 8 laps; C. Edwards 3 times for 8 laps; A. Almirola 1 time for 5 laps; J. Allgaier # 3 times for 4 laps; M. Waltrip 2 times for 4 laps; K. Kahne 2 times for 2 laps; T. Bayne(i) 1 time for 2 laps; J. Logano 1 time for 2 laps; D. Patrick 1 time for 2 laps; A. Dillon # 1 time for 1 lap; A. Allmendinger 1 time for 1 lap. Top 16 in Points: D. Earnhardt. Jr. – 48; D. Hamlin – 43; B. Keselowski – 42; J. Gordon – 40; J. Johnson – 40; M. Kenseth – 38; R. Stenhouse. Jr. – 37; G. Biffle – 37; A. Dillon # – 36; C. Mears – 34; J. Logano – 34; K. Harvick – 31; J. Mcmurray – 30; B. Labonte – 29; R. Sorenson – 28; C. Edwards – 28.